Did you miss the latest event or wish you could see it again? We've got you covered! Below are recordings from all our recent forums and other CGS-MN sponsored events. Additional Further Reading and Web-Based Resources on each Forum topic will also be added to this page. In October, the United Nations (UN) released a report from the world’s leading climate scientists indicating that negative climate impacts are less than a decade away. In November, Minnesotans elected many candidates to public office who listed climate action as one of their top priorities. And this December, diplomats from nearly 200 countries from around the world convened in Poland to discuss accelerating their climate commitments. Minnesota and the world now face a critical moment of opportunity to achieve deep, economy-wide carbon reductions through policy innovation. Fresh Energy is partnering with Global Minnesota for a discussion featuring our Science Policy Director J. Drake Hamilton, on developments from the most recent global climate summit and to share ideas about productive next steps in Minnesota. The program includes a panel discussion with other experts who attended the UN climate change conference. Presented in partnership with the Friends of the Minneapolis Central Library, Hennepin County Library – Minneapolis Central and Global Minnesota. Citizens for Global Solutions Minnesota is receiving a $9,500 grant from the Minnesota Historical Society to collect information about Minnesotans who have contributed to the goals of the UN and tried to make that institution more effective during its 75-year history. Our organization is invited to submit another grant request in 2019 outlining how our collected material could be used in commemorating the 75th anniversary of the UN in 2020. JIM NELSON will be leading this project. At the Annual Meeting he will share anecdotes from his five decades of involvement as a volunteer in the work of the UN. This is also a “listening session” for those present to offer suggestions for what will be included in our “Minnesota United Nations History” project. We hope our past sustained efforts may inspire future generations. JIM NELSON is a lifelong Minneapolis resident. He earned a degree in Economics from the University of Minnesota and a Certificate in International Management from Minnesota State University, Mankato. He worked in Project Management and Administration over 40 years in three Twin City industrial Aerospace companies: Sperry Univac, Control Data and Honeywell. In parallel to his corporate career Jim enjoyed working in small scale farms and gardens. In this avocation his interests focused on native plants and insect pollinators. Jim is proud of his community involvement, especially in environmental affairs. He attended the first UN conference on the environment in 1972. He was recognized with the Honeywell Corporate Community Service Award in 1996 for community education about the UN. The UN Association of MN honored Jim with the Harold Stassen Award in 2016 for 50 years of service. The Johansen Foundation (Denmark) presented a lifetime achievement award for Global Sustainability in 2017. Louisa Hext is the North American coordinator for “The F Word | Stories of Forgiveness.” The exhibit curated in 2004 by The Forgiveness Project based in London, U.K uses story-telling to explore ideas around forgiveness, reconciliation and conflict resolution and how they can be used to impact positively on people’s lives. Louisa coordinates a speaker’s bureau and engages in the challenging debate around forgiveness, calling into question our often fixed beliefs about right and wrong, good and evil, justice and morality. Louisa also has extensive experience working around human rights and has advocated for over twenty years. She is focused and passionate, always committed to ensuring equitable access of resources for the common good. She is a skilled and experienced mediator, consultant and coach. She serves as the Ambassador for The Charter for Compassion’s Peace and Restorative Justice sectors and has advanced degrees in Sociology. Louisa is a member of the Leadership Team of the Minnesota Alliance of Peacemakers. In Somalia, poetry has long been the preferred medium for artistic expression—in fact, the country is sometimes called “the land of bards.” This is in part because of Somalia’s long Islamic tradition, which discourages the visual depiction of people while embracing the power of the spoken word. Yet Somali artists have also turned to other media, including drawing, painting, photography, and video. 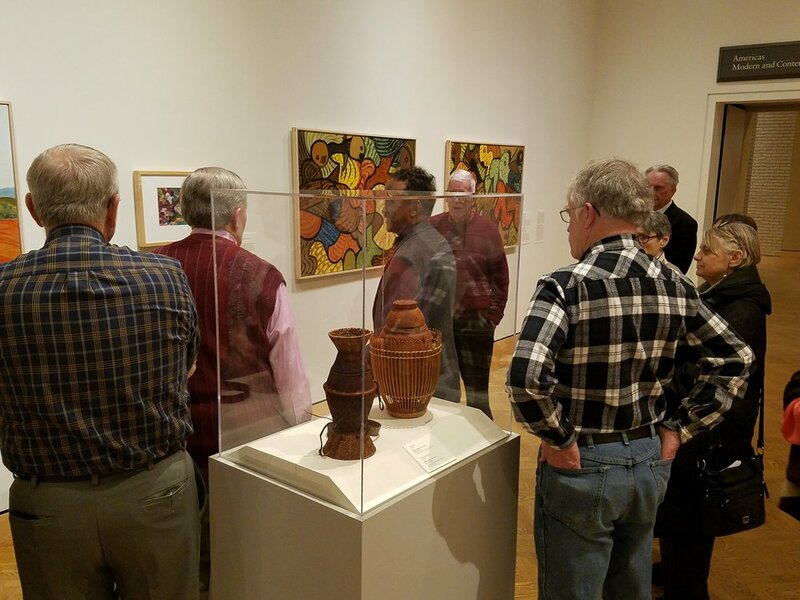 This exhibition celebrates the work of three Somali visual artists from the Twin Cities: Hassan Nor (81), Aziz Osman (69), and Ifrah Mansour (30). Nor and Osman were born in Somalia and grew up there, migrating to the United States in the 1990s after the outbreak of civil war at home. 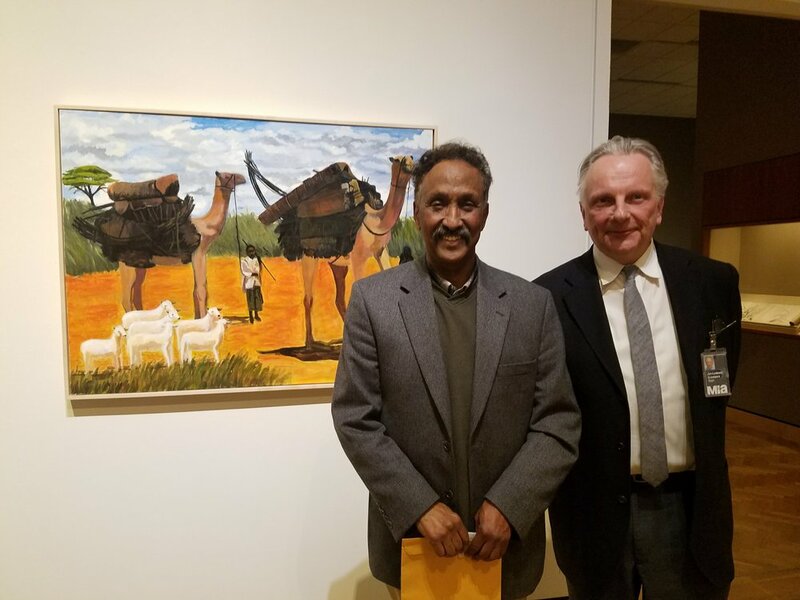 Their drawings and paintings look to the past, depicting life in Somalia before the war and in transit, on the way to their new country. Mansour, on the other hand, was born in Saudi Arabia and raised in Minnesota. Her video addresses the cultural ignorance and stereotypes she encounters in her daily life. All three share stories of exile, memory, identity, pride, and resilience. 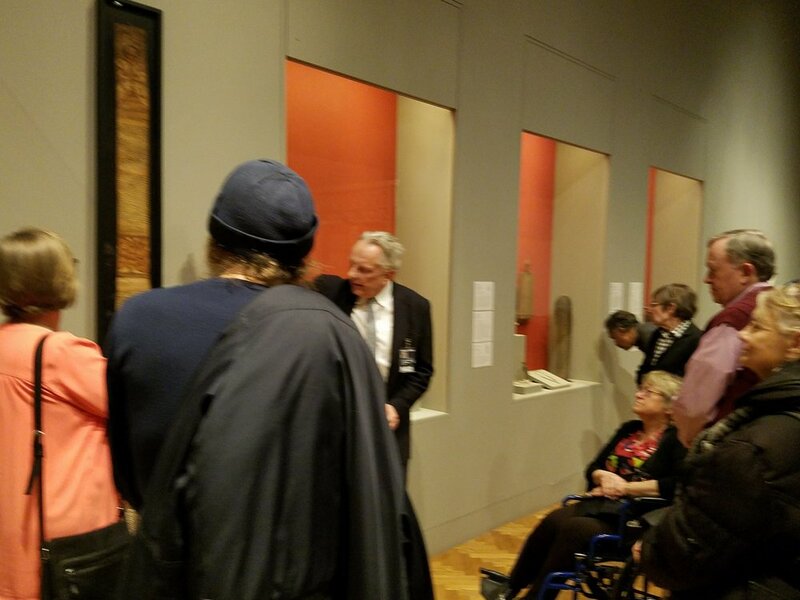 Jan-Lodewijk Grootaers, Mia Curator of African Art, ‘Arts of Africa and the Americas’ Department Head, and organizer of the “I Am Somali” exhibit, will provide us with a private group tour of the “I Am Somali” exhibit, as well as other Somali and Islamic artwork from the permanent galleries. Artist Ifrah Mansour will join us to talk about her work. This program is sponsored by CGS-MN, and co-sponsored by Minnesota Alliance of Peacemakers, and United Nations Association, MN. Haley Kimmet: Raised orally deaf, Haley’s personal experiences have bolstered her professional endeavors, including traveling on the Americans with Disabilities Act tour bus to educate communities, supporting international exchange and development programs with Mobility International USA and the Mandela Washington Fellowship, and serving as a member of the Developmental Disabilities Council. She is pursuing her Master of Public Affairs degree at the Humphrey School of Public Affairs. Laurie Kincade is a 3rd year School Psychology Ph.D. student at the U of MN. Her main research interests include issues of diversity and equity in schools and training programs, the student-teacher relationship, mental health and social-emotional learning programs in schools, inclusive education for students with disabilities, and self-determination of people with disabilities. Rick Cardenas worked for Advocating Change Together (ACT), first as organizer for Remembering With Dignity (RWD) and then as co-director for 19 years. Prior to that Rick worked at the St Paul office of Senator Paul Wellstone and most recently is consulting on the Reconnect Rondo project. He continues consulting at Access Associates, doing physical and programmatic consulting on disabilities. Members of the Loft Peace and Social Justice Writer's Group will read excerpts from their inspiring new book: Turning Points: Discovering Meaning and Passion in Turbulent Times. These are riveting accounts of how the turning points in the lives of our authors over the past half-century led them to find and implement creative solutions to global issues and how those lessons can be applied in today's turbulent times. Audience members will be encouraged to share their turning point stories. Featured presenters include Philip Lund, founder and facilitator of the writer’s group, Burt Berlowe, award-winning author of the compassionate rebel anthologies; India native Robbie Orr, who is currently writing a series of novels titled The Repentant Radical Trilogy, and Korean War veteran and peace educator Roy Wolff. NEXT STEPS ON DEEP CLIMATE ACTION: HOW CAN MINNESOTA LEAD? J. Drake Hamilton is the science policy director at Fresh Energy, Minnesota’s 25-year-old nonprofit focused on climate and energy policy. A geographer and climatologist by training, J. is an expert in climate policy, and will be participating in the November 2017 UN Conference of Parties meetings on climate action in Bonn. She’ll report back on what was achieved at COP23, next steps for nations and the world, and how you can act effectively. Minnesota has achieved high levels of carbon reduction at no additional cost, and--as a heartland state that is dependent on fossil fuels--has great potential to demonstrate effective climate policies at the scale of the climate problem. Fresh Energy’s work can be found online at fresh-energy.org. This program was sponsored by CGS-MN, and co-sponsored by Minnesota Alliance of Peacemakers and United Nations Association, MN. Bellicose threats by Donald Trump and Kim Jong-un have generated massive anxiety about a potential war on the Korean peninsula. What are the roots of the current conflict? How did we get into such a dangerous situation? What are the military capabilities of each side? Could military action lead to the use of nuclear weapons? Can Congress block Trump's sole power to authorize a nuclear strike? Is there a diplomatic way forward without resorting to military action? What are the the roles of South Korea, China, Japan, and Russia? Our speaker will also present information on the new UN Treaty Prohibiting Nuclear Weapons, a potentially historic document adopted by 122 nations. Jay Kvale is a former teacher and travel guide for the state of Minnesota who became a peace activist upon retirement 10 years ago. Jay is a member of the Minnesota Peace Project, Hiroshima-Nagasaki Commemoration Committee, and WAMM. He specializes in the history, deployment, and disarmament of nuclear weapons. This program was sponsored by CGS-MN, and co-sponsored by Minnesota Alliance of Peacemakers, United Nations Association, MN, and the Minnesota Peace Project. In March 2017, The Advocates for Human Rights led a delegation to conduct human rights advocacy before the United Nations. The speakers will discuss their experiences traveling to Geneva to advocate before the Human Rights Council, and will describe how they used UN human rights mechanisms to enforce international legal standards related to women’s rights, the death penalty, torture, racial discrimination, and the rights of persons with disabilities, as well as the impact of their work on domestic foreign laws and practices. This program was sponsored by CGS-MN, and co-sponsored by Minnesota Alliance of Peacemakers, United Nations Association, MN, and The Advocates for Human Rights. Human Rights Tools for a Changing World, chapter 9: "Advocacy at the UN"
In 2002, the International Criminal Court (ICC) began operating in The Hague, Netherlands, with the mandate to prosecute genocide, war crimes, crimes against humanity, and aggression perpetrated by individuals anywhere. This is the world’s first permanent court with this mandate. The US had a prominent role in the creation of the ICC, but has not signed the Rome Statute, the document that provides for the creation of the ICC. This program was sponsored by CGS-MN, and co-sponsored by Minnesota Alliance of Peacemakers, United Nations Association, MN, and World Without Genocide at Mitchell Hamline School of Law. "There can be no peace without justice, no justice without law, and no meaningful law without a Court to decide what is just and lawful under any given circumstance." Nuremberg taught me that ... if we do not devote ourselves to developing effective world law, the same cruel mentality that made the Holocaust possible might one day destroy the entire human race." Russia and the United States have entered a new form of the Cold War. Autocratic leadership by President Putin and increasingly by President Trump have produced new issues, many of which have existed from the past century. What are the implications of Russian actions in Ukraine, Crimea, Western elections and the Middle East? Is Russia capable of democratic governance? Are Russian and American interests diametrically opposed, producing another period of potential nuclear conflict? The choices of Putin raise questions on the world role of the United States, as well as the long-term potential of Russian influence with a damaged economy and governmental systems threatened by historical forces. How we approach and resolve these issues will impact the coming years and world events. Todd Lefko is President of the International Business Development Council, an import-export firm, and writes for Rossiske Vesti, a Russian political newspaper and Rusya-Al Youm, the Russian Arabic Television channel for the Middle East. He has taught urban affairs, political science, international relations, political philosophy, political campaign management, leadership, organizational development and public administration and sociology at the university level, and has lectured at universities in Russia, China, Belarus, Kazakhstan and Turkmenistan. PDF: "Russia: Questions for Discussion & Changes in US-Russia Relations Since the Cold War"
Shawn Otto (www.shawnotto.com) is co-founder and producer of the US presidential science debates at ScienceDebate.org. He is the award-winning author of "The War on Science: Who’s Waging It, Why It Matters and What We Can Do About It," which has been called "a game changer, and probably the most important book you'll read this year." He is also an award-winning screenwriter and novelist, best known for writing and co-producing the Academy Award-nominated movie "House of Sand and Fog," and the LA Times Book Prize finalist literary crime novel, "Sins of our Fathers." He has advised science debate efforts in many countries and speaks worldwide on the critical role of science, evidence, and objectivity in free societies. World Law Day was an innovation of the Minnesota World Federalists in 1963, and was an annual program for over 30 years; it was re-initiated as an annual program in 2013. The World Is My Country film is about World Citizen #1: Garry Davis, who spent 65 years of his life as a citizen of no nation, only Earth. For years he traveled around the globe on his World Passport while engaging in adventures so unique that his life made a front-page headline story in The New York Times and inspired stories in The Washington Post, The LA Times and other worldwide media. Hailed by Albert Einstein for “the sacrifices he has made for the well-being of humanity,” extolled by Buckminster Fuller as the “New World Man,” and egged on by Eleanor Roosevelt to start “a worldwide international government,” Garry Davis was a pioneering thinker, an author of 10 books, and founder of the World Service Authority - an organization in Washington, D.C. that issues World Passports to stateless refugees and to people who think globally, and above the nation-states that carve up our one globe. To find out more go to www.theworldismycountry.com. Roger Prestwich served as the international program director at Metropolitan State University’s College of Management for many years, and as the college’s interim dean in 2013-14. Before joining Metropolitan State, Prestwich served as director of the Minnesota Trade Office education program for 12 years and of the World Trade Conference Center for two years. Now retired, Roger continues consulting with organizations and businesses, and remains engaged internationally, serving on the Saint Paul-Minneapolis Committee on Foreign Relations, the Minnesota District Export Council, and the Midwest Global Trade Association. Overpopulation needs to come back into our discourse, but in a new way. GONE must be any question about why we are going to wrestle with this issue again. We are going to do this because it is necessary. It is necessary but ONLY if we want to be successful in our progressive goals. If you want to address poverty, traffic, or water scarcity you must have the overpopulation discussion. It is humane, it is necessary and it is overdue. Ms. Berg will explain the Trans-Pacific Partnership (TPP) in terms of its history and what it is really about; how all trade agreements are connected; what is still out there being negotiated; and what "trade" could end up looking like with a Donald Trump presidency. UN Human Rights Treaties: Why Isn’t the U.S. Leading? What is the history of human rights treaty ratification by the U.S.? How has this changed over time, and why? Which of the treaties deemed most important for world-wide cooperation have yet to be ratified by the Senate? Who is opposing their ratification, and who is working for ratification? What actions can we take to advance human rights by advocating for ratification and implementation of these treaties? In his presentation, 27-year-old Mr. Walid Issa shares his story and discuss the projects he has created to promote peace between Israelis and Palestinians. Raised in the Dehesha refugee camp in Bethlehem, Walid is the founder of the American Palestinian Hope Project and the co-founder of the Shades Program on Negotiation. He has received a Welter Global Citizen Award from the Minnesota State Colleges and Universities, and a Student Leadership award from St. Cloud State University, where he received his degree in Economics. Don’t miss a chance to share ideas with this inspiring young peace entrepreneur! Tom Hanson’s U.S. Foreign Service postings included East Germany, France, Norway, the Soviet Union, Sweden, and the former Soviet Republic of Georgia. He also participated in the opening of new U.S. embassies in Mongolia and Estonia. Currently, Tom serves as Diplomat in Residence at the University of Minnesota – Duluth and is a member of MIC’s Great Decisions advisory committee and frequent Great Decisions speaker. He is also a board member of the Oslo Center for Peace and Human Rights, U.S. Foundation. Tea Rozman-Clark, a 2015 Archibald Bush Fellow and founder of Green Card Voices, brought three young immigrants who hold Green Cards: Zaynab Abdi from Yemen, Fosiya Hussien from Somalia and Wendy St. Felix from Haiti. The students are among those whose experiences are included in the recently published book, Green Card Youth Voices, all present or past students at Wellstone International High School in Minneapolis. Tea described the Green Card Voices program (both the general and youth programs), and each of the three youth gave a brief summary of their story. To purchase the Green Card Voices book click here. Authored by 30 students from Wellstone High School, edited by Tea Rozman-Clark and Rachel Mueller. In September of 2015, Green Card Voices recorded 30 stories of immigrants from Wellstone International High School. These courageous youth coming from 13 countries shared their powerful stories of family, school, change, and dreams. Mnar Muhawesh is founder, CEO and editor in chief of MintPress News, and is also a regular speaker on responsible journalism, sexism, neo-conservativism within the media, and journalism start-ups. -Oren Gross, the Irving Younger Professor of Law and the Director of the Institute for International Legal & Security Studies at the University of Minnesota Law School. -Terrence Flower, Emeritus Professor of Mathematics and Physics, St. Catherine University, St. Paul, Minnesota. Prior to being appointed director of The Advocate's Women'sHuman Rights Program, Rosalyn Park worked as a staff attorney in theWomen’s Human Rights Program and on special projects. She hasassisted in conducting fact-finding missions in Bulgaria, Tajikistan, Croatia, Mongolia, Sierra Leone, and Serbia. She has co-authored severalpublications and is a frequent guest lecturer in the community. In addition, she teaches global gender violence at the University of Minnesota as anadjunct professor. This is the Annual Dinner presentation for 2015 for the Citizens for Global Solutions-Minnesota. Rosalyn Park of the Advocates of Human Rights presents on the international problem of Domestic Violence and how her center addresses monitoring and promoting improvement. David Paxson is a national leader on the issue of sustainable population, participating ininternational meetings – including the United Nations Population Conference in Egypt – and he hasspoken to groups across the United States. He graduated from the University of Michigan and workedat the Center for Population Studies at the University of Minnesota. In 1991, David retired from thefinancial field and founded World Population Balance. Members include some who are pro-life andothers pro-choice, working together to find common ground. A native of India, Dr. Parekh earned his Ph.D. in physics from the University of Rochester. Hetaught for fifteen years at ND State University and was a research scientist at the ND WaterResources Research Institute in Fargo. He has live in the Twin Cities since 1987. As a consultant forUS and Indian companies and NGOs, his work involved technology transfer and trade in theenvironmental and rural development sectors. His current passion is to fight the scourge ofmalnutrition in Mumbai and other parts of India. He has long been active in Citizens for GlobalSolutions, Minnesota; the St. Paul/Minneapolis Committee on Foreign Relations; and the UnitedNations Association of Minnesota, where he set up the Minnesota Millennium Initiative to championthe Millennium Development Goals. He serves on the Board of Toddler Food Partners. Three years ago, Toddler Food Partners, a Minnesota-based NGO, built a pilot projectfacility to make Ready-to- Use Therapeutic Food (RUTF) in a health center in Dharavi, Mumbai, arguably Asia’s largest slum. An adjacent hospital embarked on a controlled clinical trial to testRUTF’s efficacy in comparison with Standard Nutrition Therapy (SNT) with a sample of 200 children. The eight-week trial showed that RUTF substantially out-performed SNT. The implications are far reaching. Dr. Parekh explains the wider global context.